I am so impressed by the Forestry Commission’s Gruffalo activities. I watched loads of little children totally enthralled as they followed the trail in Westonbirt Arboretum. Such a captivating and inspiring idea. I’ve been giving lots of training on effective provision for babies and under 5s in museums, galleries, libraries and archives. It’s great to have the opportunity to explore good practice in depth, identifying ways to support very young children’s learning and development, and discussing how to engage them, and their parents, carers and families. I love this picture of a Dinky Dragons session at Cardiff Story, where I gave some courses recently. I thought it might be helpful to share some of the publications, guidelines and case studies I have found useful and informative. Library Services from Birth to Five: Delivering the Best Start will be also very helpful I’m sure, though I’m very biased, having contributed a chapter. I’m off to Wales shortly to give courses for museum, library and archive staff on working with babies and under 5s and on rhyme times. Putting the courses together has made me think a lot about early childhood development and ways to make support for learning and language effective. These are some of the websites, case studies and publications I’ve found particularly valuable. I have loads of photos of good practice to show on the courses. 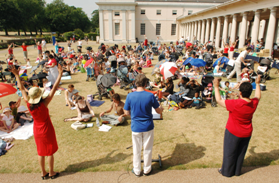 I love this one of a wonderful Rhymathon at the National Maritime Museum organised by Greenwich Library Service a few years back. What a treat to attend the wonderful Lighting the Future conference last weekend. I was delighted to give a workshop on how school and public libraries can support children and young people with learning difficulties. Thinking about it afterwards, I realised that lots of people might find these links and resources useful. Claire Welsh and Rosie Williams, Whistlestop tour of special educational needs, Barrington Stoke, 2005, ISBN 9781842993019. Those of you who have not seen them already may also like to check out my article for CILIP Update on supporting children and young people with special educational needs and my blog post about children’s books featuring disability. I am giving a course on special needs for library, museum, gallery and archive staff in London on 6 July with Creating Capacity. 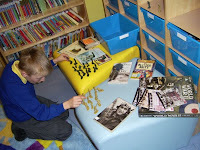 The photo shows a curiosity kit in use in the library at Lowton St Mary’s School in Wigan. I love giving training on curiosity kits. They are a fabulous way of making reading and learning more accessible. It was great to give a course on working with young offenders for CILIP South East yesterday with John Vincent of The Network. The participants were highly experienced and deeply committed, with representatives from galleries, archives, public libraries and libraries in prisons and young offender institutions (YOIs). We explored how cultural and heritage organisations can contribute to YOIs’ agendas in terms of building young offenders’ confidence and self-esteem, fostering practical and social skills, and reducing re-offending rates. I found the debates about the constituents of effective projects and on-going work to support young offenders particularly interesting. Evidence shows that young offenders are more likely to respond enthusiastically to schemes that tie in with their interests and experiences, produce something tangible, and give them a sense of achievement. The involvement of the young people themselves in decisions is crucial. Storybook Dads, the Six Book Challenge and the Arts Award have been used extremely successfully in many YOIs, to give just a few examples. We talked about the importance of developing good partnerships between YOIs and cultural and heritage organisations, and the value of preventative approaches, working with Youth Offender Teams and virtual schools, for instance. Many thanks to everyone for sharing so many excellent ideas, and an especial thank you to Rachel Westworth for her invaluable case study on her work with young offenders at HMP Lewes. While on the subject of young offenders, this is a useful article about how ex-offenders are helping turn young people away from crime. I have been a family literacy tutor for many years, and my work in schools and libraries has made me a passionate believer in the value of family learning. I have experienced first hand the transformations that it can achieve for both children and adults. It is incredibly exciting and moving to watch skills and confidence grow. This family were dedicated attenders of a series of family literacy workshops I gave for Barnet Library Service. Their concentration says so much. I love giving training on family literacy and on family learning more generally, and I am delighted there is so much interest in putting on family learning programmes and activities in the cultural and heritage sector. In addition to the important benefits to families that these initiatives bring, they are also excellent in terms of breaking down barriers and creating new audiences. My next openly available family learning course is on 17 November, run by Creating Capacity. We will have the opportunity to explore ways to make family learning a reality in museums, galleries, libraries, archives and other heritage organisations, and I will bring along lots of inspiring case studies. In the meantime, there is a very useful recent publication on the topic from niace, for anyone who has not already seen it.